Fly Fishing: If you're looking for wild brown trout and fat, feisty rainbows, come to the Bighorn River in southeastern Montana! Known as one of the best trout fisheries in America, this amazing catch and release river has water so gin-clear you can sight-fish year-round. Our experienced, local guides offer instruction for all skill levels, from beginner to veteran. We'll share the time-proven secrets of the 'Horn.' You'll get a full day on the river and the fishing adventure of a lifetime, complete with savory streamside lunches. Check out our lodging/meal packages at Old Hookers Guest House in Fort Smith. 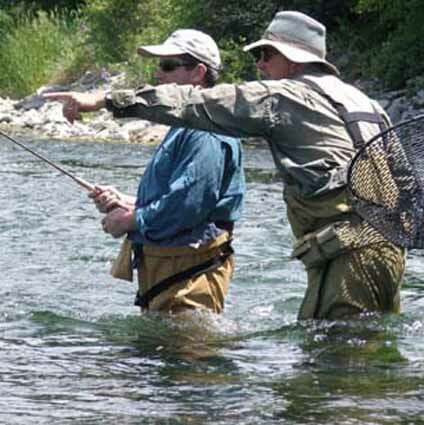 You're welcome to bring your own gear, or for those traveling light, ask for our 'Just Add Water Package' with rods, reels, waders, boots and proven local fly patterns. Hunting: Eastslope Outfitters offers guided access to more than 30,000 acres of private land in the Yellowstone River and Bighorn River valleys, with miles of river bottom, range, cropland, canyons and pine ridge habitat, as well as a trophy whitetail property. We offer lodging and guided hunts for deer (whitetail and mule) and antelope, Canada geese (70,000+ honkers), seven species of ducks, pheasant, sharptail grouse, Hungarian partridge, and Merriams turkey (spring gobbler). Cast'n Blast: Want it all? Eastslope Outfitters can customize your trip to include both fishing and hunting. Fall Cast'n Blast trips include Bighorn River trout fishing with pheasant, upland bird, waterfowl or turkey hunting in the Yellowstone and Bighorn River valleys. Lodging and meals included. We have camps near the Bighorn River at Fort Smith and in the Yellowstone River Valley nera Hysham/Custer.